After months since I've last visited Pontini, the Italian Semi-Lunch Buffet has been refreshed with more exciting features such as live foie gras station and artisan cheese room. The feasting style remained the same, as diners can continue to indulge in all-you-can-eat antipastis, pastas, pizzas and desserts in addition to a choice of main course. Pan-seared foie gras already sounded like a luxury treat but how about having it free flow? This is an absolute must for any foie gras enthusiast. Served on toasted brioche, the foie gras is nicely crisp the edges with interiors that are silky smooth. The best thing is the variety of jams and condiments that keeps one from feeling jaded of the richness. Adjourn to the all-new artisan cheese cellar and you can find an prestige assortment of cheeses imported from Italy. According to the expert recommendations from Chef, one should commence from the soft blue cheese and end with the hardest Grana Padano Parmigianno. I obediently started from the gooey blue cheese, but soon "jumped queue" to the Truffle Pecorino and "fast forwarded" to the Grana Padano Parmigianno (the giant cheese bowl of the artisan cheese cellar) None of these disappointed and I highly recommend anyone to explore this cheese wonderland even if you seldom take cheese in your daily life. Similarly, diners can customize their pastas and feast as many plates to their hearts' desires. 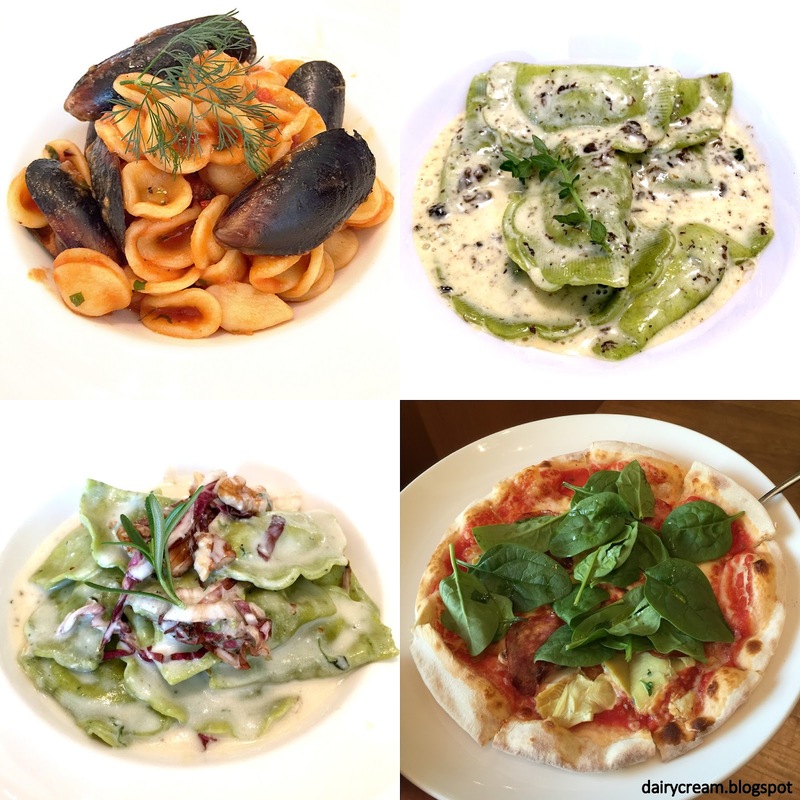 While the team of chefs remained the same, the pastas were significantly tastier than before. For instance, I have a penchant for cream based pastas and these toothsome Ricotta and Spinach Ravioli, tossed in Parmesan Cheese Fondue and finished with Raddichio and crunchy walnuts, acted as a decadent interlude to the meat-based main courses. The Roman Carbonara style was even better, striking just the right balance between savoury and peppery. Meantime, the Chilli Pesto with Fresh Tomato Sauce is also another appetizing yet robust dish mixed with black mussels and olives. While some of the mains were more appealing than others, there isn't anything which I particularly dislike. For instance, the Oven baked Barramundi Fillet was unquestioningly moist, crisp and went smoothly with the creamy grain mustard sauce. This dish would feel incomplete without the sautéed spinach and the Castelluccio lentils which offered pleasant bites. Leaning against a yellow polenta cube and aubergine ragout, the NZ Lamb Racks is a straightforward dish served without fanfare. It might even appear deceptively dull, but it is precisely the simplicity that brought out the clean taste of the meat. Nevertheless, I would pick the Roasted Spring Chicken with Chianti red wine jus if I were to dine alone here without any companions to share a variety of mains. I thought I was full but I felt pangs of hunger as soon as it arrived. The aroma was dancing in the air and the meat was perfectly seasoned, moist yet crunchy at the part near the wings. Don't miss the soft bed of arugula leaves below the chicken that had soaked up all the juices trickling down. Truly a dish that is executed with finesse! 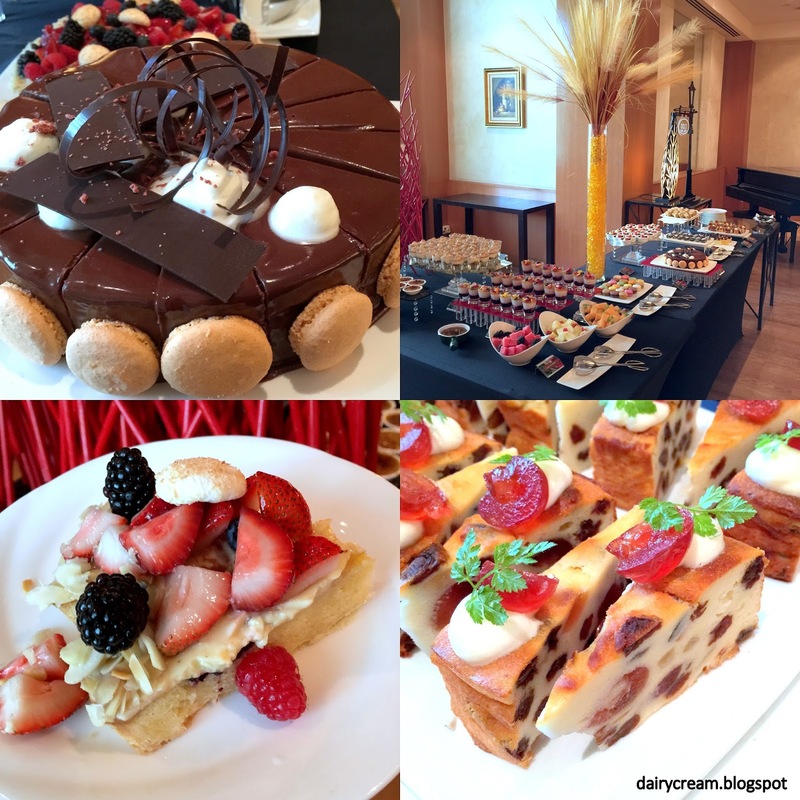 It was heartening to see that the dolce spread has expanded from mini dessert shooters to macaroons, whole cakes and tarts such as mixed berries fragipane tart and the chocolate truffle cake. The latter was exceptionally good--so rich and potent with hints of tang from the raspberry. Though my favourite cannoli was available, the pastry was no longer as crunchy as when they were piped a la minute from the live cannoli station. That said, this re-visit still brings me great satisfaction as there is not only more variety but remarkably improved quality. 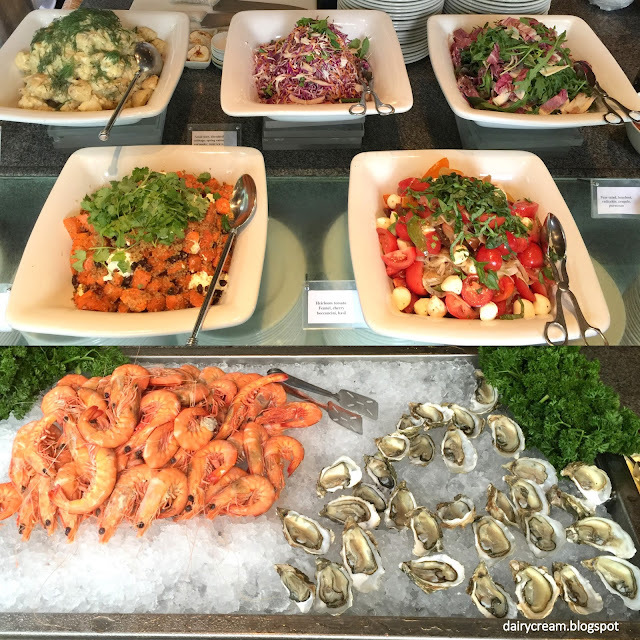 Being already very reasonably-priced previously, the revamped semi-lunch buffet is truly a super delicious deal not to be missed. 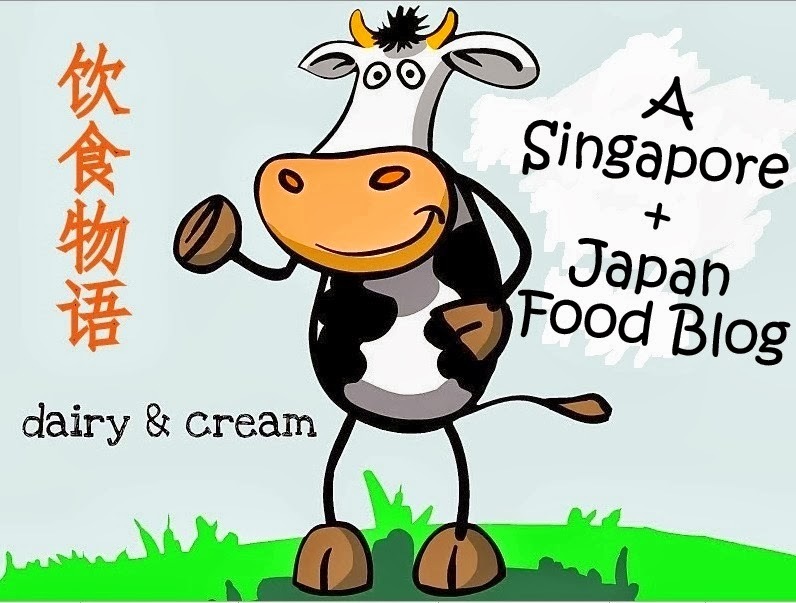 $58++ for adult and $29++ for child. Level Two, Grand Copthorne Waterfront Hotel. Ever heard of cocktails and desserts that are infused with Orchid flowers? As Singapore's 50th birthday reaches its crescendo, Halia has introduced a unique SG50 Orchid Tea Menu featuring cocktails, mocktails and desserts inspired by Asian ingredients and most importantly, our national flower. For something non-tipsy, there is the Singapore Jubilee ($10++, top pic) , a robust red-tea based drink of both sweet and tangy, thanks to the chemistry between Vietnamese honey and homemade lemonade. The chunks of blueberries put an untraditional twist to this drink, which has a soothing vanilla aroma that instantly uplifted my spirits. To mediate the tones of Sailor Jerry spiced rum as well as the sourness from lemon juice, apricot jam has been added into this Yam Seng($23++), another red-tea based concoction. I guessed that the Orchid Red Tea might be the most versatile type of orchid tea compared to the white and gold variation, otherwise it would not have been the foundation across all three limited edition beverages. I've heard of lobster roll and a hamburger. But never a lobster burger. Put the two together into an equation with drizzles of miso mayo and tobiko, it is simply pure decadence. Mound atop a bed of shoestring fries, this heart-stopping Miso Lobster ($34) is one of the new exciting dishes on the revamped menu of Marmalade Pantry. It's latest outlet tucked beside the reception area of Oasis hotel in Novena exudes a totally different vibe from the Ion Orchard outlet as one can enjoy some intimate space instead of being watched by the shoppers. Unlike the lofty Lobster Burger, the Lobster Barley Risotto ($32) displayed a kind of rustic countryside charm as barley was used instead of the usual Italian short grains. These underrated cereal grains soaked up the flavorful stock amazingly well to form a delicious chewy pud that retained a nice firmness. Mixed with garlic flower, butternuts, carrots and onions, it was a delightful and easy dish to eat with just a spoon, even though the lobsters were a little too salty. CONANA Wa Pasta and Cafe : It's Conana, not Coconut! It was a boring lazy summertime back in late June/July last year. It was less than one month before I returned to Singapore to become a real shakaijin 社会人 or you can say, a corporate worker. Having been on the hunt for some black sesame sweets, I discovered that there was a black pudding parfait from a wa-cafe called Conana which was conveniently located in Shinjuku Lumine Est. Although I was honestly more attracted to their colorful wafu 和風 pastas than desserts, I devoted my limited stomach capacity to their sweets. Much to my disappointment, the parfait turned out to be a smooth pudding served with rich black sesame sauce and some sesame crisps. The size was also smaller than expected, which elicit no further excitement than an average custard pudding from the convenience store. Canola oil, olive oil, grape seed oil....there are all kinds of oil which boast healthy benefits but have you heard of avocado oil? I never heard of it until I was introduced to Acado, world's largest selling brand of avocado oil made from the world's best Michoacan Avocados in Mexico. After doing a quick research, I discovered so much good benefits of avocado oil that I never knew before. It is not only free from Cholesterol and Trans fat, but also 25% lower in saturated fat than any other edible oil. Furthermore, unlike most oils like peanut oil, sunflower oil or sesame oil, there is no distinctive flavor of avocado that will influence the taste of the dish. It has the HIGHEST smoking point among all the oil (525F), making it the perfect oil for any deep frying besides other wonderful uses such as stir fry, roast, marinades, salads etc. Since it can be used to replace butter, margarine, shortening or margarine, I decided to play it around with cakes. The first thing that pop up in my mind was a simple avocado oil cake. We all know Italians love their olive oil cakes since olive oil is a key ingredient of their cuisine. Hence, I replaced olive oil with avocado oil in this original Almond olive oil cake recipe adapted from Gina DePalma, a renowned Italian pastry chef who used to work at Babbo Ristorante and Enoteca by Mario Batali for 15 years and writer of several cookbooks. Orange juice is also replaced with Yuzu juice for a lighter zesty taste. 1) Preheat the oven to 350°F (approx. 175 degree celsius). Grease and flour a 9-inch round cake pan or springform pan and set aside. 3) For Part B: Whisk the eggs lightly to break up the yolks. Add the sugar to the bowl and whisk it in thoroughly. Add the ACADO avocado oil and whisk until the mixture is a bit lighter in color and has thickened slightly. Whisk in the vanilla extract and zest, followed by the yuzu juice. 4) Add A to B and whisk until you get a smooth, emulsified batter, about 30 more seconds. 5) Pour the batter into the prepared pan, and bake the cake for 30 to 45 minutes, rotating the cake pan halfway through the cooking time to ensure even browning. The cake is done when it has begun to pull away from the sides of the pan, springs back lightly when touched, and a cake tester inserted in the center comes out clean. Allow the cake to cool for ten minutes in the pan, then gently remove it from the pan and allow it cool completely on a rack. 6) Make glaze: Melt the butter over medium heat in a small, heavy saucepan. When the bubbles subside, lower the heat and watch the butter carefully, swirling it in the pan occasionally to distribute the heat. When the butter begins to turn a light tan color and smells slightly nutty, turn off the heat and let the butter sit. It will continue to darken as it sits. 7) While the butter cools, sift the confectioner's sugar into a medium bowl. Whisk in the milk until completely smooth but thick, then slowly whisk in the butter. Taste the glaze and add a few drops of lemon juice to balance the sweetness. Stir in the toasted almonds. Spread the almonds and glaze onto the top and sides of the cake and let it sit until set and dry. The result of using avocado oil turned out to be surprisingly good as the cake was delicate and lighter than usual, with subtle taste and fragrance of citrus as the neutral avocado oil did not overpower the other ingredients. I thought the glaze was a bit redundant so I highly recommend you to skip the glaze and just focus on the cake! Less is always more. Compared to other avocado oil brands, ACADO uses the premium grade of avocados, which means that the nutritional value of avocados will stay the same even after 1 year! With a standard shell life is up to 3 years, it is definitely a good healthy addition to your kitchen pantry. Available in 250ml, 500ml, 750ml and 1 litre, you can find this at Meidi-ya, NTUC finest, Cold Storage and all leading gourmet stores in town. At $30 for 1 litre or $16.95 for a 250ml bottle, it is definitely not the cheapest oil on the shelf. However, if you consider carefully all the wonderful health benefits and convenience it brings, this is definitely a keeper in the kitchen! They don't call this afternoon tea "Tiers of Joy" for nothing. Before we even begin, there were a few passers-by who were ogling at our elegant triple decker that features an impressive ensemble of assorted sandwiches, macarons, classic French pastries including rich dense earl grey brownies and superb raisin scones. As the name makes clear, it's all about experiencing an X-traordinary culinary journey of the senses at Xperience Restaurant. 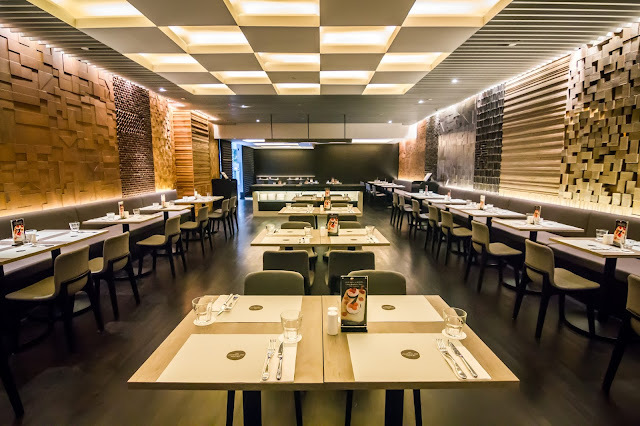 Located inside a French luxury hotel situated right at the heart of the CBD area, this award-winning restaurant strikes out a league of its own with eclectic French fusion cuisine that are blended with touches of Mediterranean, Italian and Asian flavors. It barely takes anyone around 10 seconds to walk to the restaurant from the entrance as it sits right next to the reception counter. Decked out in romantic LED lightings and ostentatious hexagonal structures, the restaurant draws attention to its centerpiece, a funky and plush "bed table" where experience-seeking guests can jump into and enjoy the meal in full luxury. More importantly, the kitchen is helmed by Chef Anne-Cecile Degenne, one of the few female hotel executive chef in Singapore with previous working experience under the world’s best chefs such as Michel Bras and Jean Georges Vongerichten. Divided into starters, entrees, desserts, the menu is a straightforward one yet nothing short of efforts towards meticulous design. There are labels "juicy", "silky", "saucy" and "zesty" next to every dish to guide diners on their gastronomic journey, which reflects the simultaneous culinary focus on textures. For instance, the well-executed Pan Fried Foie Gras ($21++) lived up to the "silky" title with its creamy soft interior, which contrasted smoothly with the nutty lentils and hazelnut crisp. Yet this dish could be more exciting if some sweet or tart elements were incorporated to steer it into away from solemnity. Do you know that there is an oasis right in the middle of Orchard Road? Not the fertile green area in a desert, but a relaxing all-day dining poolside restaurant tucked away from the busy shopping streets. The highlight of this alfresco BBQ buffet dinner is none other than the grill section, where the barbecue chefs battle the intense smoky heat to elevate simple meats to something truly delicious. From Sundays to Thursdays, guests can indulge in meat platters that are plated and served to the tables directly. On Fridays and Saturdays, the full buffet spread is laid out with seafood on ice and a unique Mongolian grill. At $98++ per person, the deal comes with free flow booze including Tiger/Heineken Beer, red wine, white wine, prosecco, sparkling wine, margarita, as well as soft drinks. Doesn't it sound like the great occasion to feast and drink to your heart's desire? The beauty of grilled meats lie in its simplicity. Be it the Sustainable Spencer prawns, Gai Yang Thai Chicken or the Grilled Mediterranean Vegetables and Lamb-Rosemary Sausages, they are served off the blistering grills without too much seasoning. For those looking to enhance the flavors, an army of sauces and dressings are laid readily next to the grill. It is fully up to the discretion of the guests to mix and match whatever they fancy. The Grass Fed Flat Iron Beef Steak were noticeably too raw at first but the chefs were very helpful to get it done to the ideal degree that provided nice chewiness. However, it was the humble thai-style grilled chicken that stole the limelight with its tantalizing smoky aroma and flavorful marinade. For seafood lovers like me, there is the Cajun spiced sustainable market fish and I was lucky to catch the barramundi and tuna on my visit. The former was slightly charred but the latter was perfect--rosy pink and succulent without the need for further adornment. Another pleasant surprise was the excellent roasted duck meat that is served in the style of Peking Duck with sauce and crepe. To offset the density of the meat, there are also a good variety of tasty salads such as Russian potato salad, gherkins and boiled egg, as well as roast carrot salads with quinoa and dukkah. The one that grabbed my attention was the Asian slaw with Thai sweet chilli dressing (purple). The spice from the chilli set my tongue sizzling yet I was craving for more. So appetizing and crunchy that I dashed back for subsequent servings! Over at the Sizzling Vegetable Grill Section that is only available on Thurs, Fri and Sat only, I discovered some amazing sweet potatoes and asparagus that were so brilliantly sweet. Their modest looks might not encourage you to pick them up but trust me, they are no less charming then their meat counterparts. While service standard is generally attentive across at all F&B outlets of Grand Hyatt, the service here was exceptionally attentive, friendly and prompt. 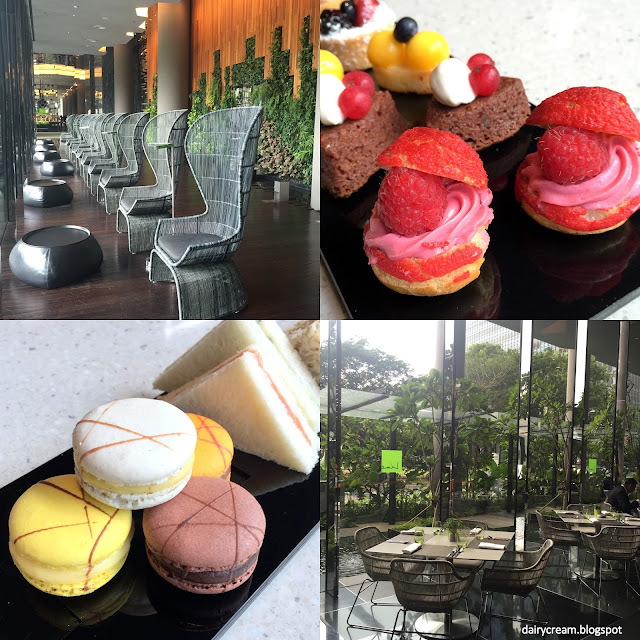 One can easily miss the desserts which are glasses of partially filled sauces with fruits/meringues that sat in the glass display, waiting to be topped with soft serve ice cream at a self-service machine by the guests. While the desserts are a far cry from the exquisite pastries from its sister restaurant Mezza 9, the grills here still sing, and that is all it really matter. In case you might not know, Dulcet and Studio is a casual dining cafe that belongs to the same company as one of my all-time favourite pastry shop in Singapore--Tampopo Deli. I see it as an extension of Tampopo Deli as it serves the same sweets but with an all-day dining menu featuring classic Japanese-Western fusion dishes such as baked rice and pastas. Basic such as the flour, pasta and rice are imported straight from Japan. For instance, the Prime Beef Stew Pasta ($23) uses Tagiolini pasta is made in Hokkaido and thus they had quite a distinctive mochi-like chewy texture. Even the beef is even flown in from Iwate prefecture, which might explain why the was utterly tender and effortless on the bite. However, tossing the pasta with a little more sauce could loosen the strands which clumped together unfortunately. Alternatively, one can also choose to have the stew with rice. Featuring premium Japanese rice baked to golden perfection in a pool of tangy meat sauce and gooey cheese, this Classic Black Pig Bolognese Doria ($16) is the ultimate comfort dish that warms your heart and fill bellies. Never knew how well bananas and baileys could work together until I chanced upon this Banana Bailey ($7), a new addition to their selection of consistently soft and fluffy chiffon cakes. I simply adore the subtle banana aroma and the alcohol is mainly concentrated in the cream, which gives just the right amount of kick for a lightweight cake. But a look at the display shelf suggests how long I haven't return since my last visit. Their new in-house pastry chef (who is the same chef in-charge of the matcha fondue here) has injected some French influences to the pastries selection here. The flamboyant eclairs reminded me of those from Fauchon but at a more wallet-friendly price of $5 each. And here comes the interesting twist. The Summer Breeze (green) is not matcha but a refreshing pairing of peppermint and apple. Meanwhile, the original custard is hidden in the one lined with corns. Containing a concealed layer of praline crunch beneath the rich praline cream, the Praline Buenos truly lived up to its name with a deep, intensely nutty flavour. Last but not least, the Matcha Swiss Roll should be crowned as the BEST Matcha Swiss roll you can ever find in Singapore and perhaps even better than some in Japan! 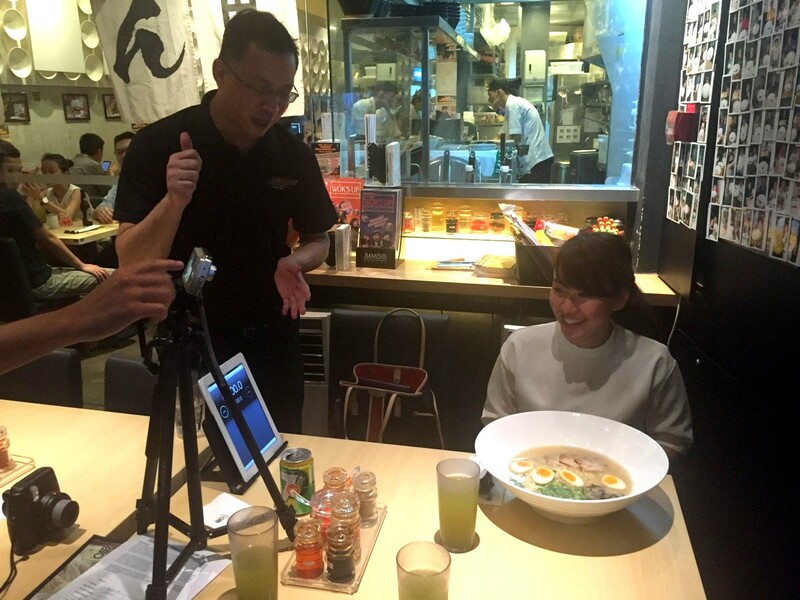 Are you game enough for YOSHIMARU Ramen Challenge 2015? Hands up if you love ramen like we do! Introducing YOSHIMARU Ramen Bar (a franchise business managed by the Jumbo Group of Restaurants) who specializes in serving authentic Hakata style ramen that is characterised by its thick hearty tonkotsu (pork bone) broth, boiled over long hours. Their bowls of high quality Hakata ramen has won over noodle-lovers of all ages from all over Japan in its 13 branches there since 1994. Here in Singapore, YOSHIMARU Ramen Bar is also well known for its taste, consistency and quality of its noodles and stock. Seated next to us were a group of loyal Malaysian fans who came down to Holland Village just for their ramen. And of course it has also attracted local patrons to participate in its annual affair: YOSHIMARU Ramen Challenge. My spontaneous sister took on the challenge last week where she had to finish one super-sized serving of Yoshimaru’s traditional Hakata ramen — 2 portions of noodles, onsen eggs, slices of char siu and a portion of black-ear fungus in a broth — within 4 min 30 sec. She managed to finish everything in the bowl despite exceeding the stipulated time limit. Savoury goodness! It's been years since I last had a lobster platter. I am not referring to the popular seafood in plastic bags these days, but those old-school lobster fruit salad with spring rolls and fried prawn rolls (hei zhor) typically served as the first dish during Chinese wedding dinners. This July, Master Chef Leong Chee Yeng of the Fullerton's Jade Restaurant pays tribute to Singapore's 50th birthday by presenting his Nostalgic Feast Menu which features classic Cantonese delights from the 70s and 80s. Curated together with Straits Times restaurant reviewer and food critic Wong Ah Yoke, the dishes not only include the extravagant lobster platter, but also familiar home-style favourites like the Claypot Pig's Knuckle with Plum Sauce and Double Boiled Winter Melon Soup. After the successful launch of 8 classic French desserts, Tiong Bahru Bakery launches another new wave of experimental creations—Savoury Croissants with an Asian twist. Available in four different variations, these aren't the typical crescent-shaped croissants, but those shaped like inflatable water rafts on rapid rivers. "Rolling Dumpling", "Running Egg", "Jumping Fish" and "Flying Pig", these croissants definitely carry catchy names that will attract anyone at first sight. It has been a while since I last visited Okada Coffee and I finally got to try its signature Mont Blanc ($9), made with the premium chestnuts from its hometown Kumamoto. The patterned layers of Mont Blanc set it apart from the usual "noodle strand" chestnut cakes, with a meringue heart that gave a good measure of crunch. The Creme de marron was full of chestnut goodness but the Creme Chantily was in short supply and I wished it could be significantly less sweet. Fortunately, it's another chestnut sweet, the Okada Roll ($8), was rational on sugar. The core was pumped up with light chestnut cream and one could inhale whiffs of eggy aroma in the pillowy sponge. The Matcha Cake is a simple construction of green tea mousse, azuki beans and sponge. Nothing much fanciful but sends a calming effect as you plunge your fork through the soft layers and deliver a bite into your mouth. While Okada Coffee is renowned for its chestnut sweets, there is also a few old-school dine-in only desserts like the "Hot Apple Pie" ($12). Like all the other pastries, this is also hand-made in Japan before being air flown and baked fresh in local kitchen. This apple pie boasts a golden rich puff pastry crust that locks the moist apple filling without turning soggy. At its most ethereal state right out from the oven, it is topped with a generous scoop of vanilla ice cream and drizzles of blueberry sauce that gives it a pleasant tartness. Sweets aside, notice that cup of coffee at the side of the hot apple pie? It's Brazil Santos Chocolate ($8.50++), a special blend of the signature Okada coffee containing a subtle acidity which I truly appreciated. It isn't any of those hot chocolate but a good solid brew with a nice bittersweet taste. No wonder it is called Okada Coffee. UNA One Rochester : Spanish Sunday Brunch!